Driving down the dirt road to the put-in at the end of Shoals Road, you cross Hall Creek, one of the six tributaries along this part of the Yadkin River. This south bank is actually the far, southwest corner of Pilot Mountain State Park, and is maintained by the North Carolina Division of Parks and Recreation. What is striking about the put-in location is how calm the river appears – almost mirror-like. Do not be fooled by the placid waters. The excitement of Bean Shoals waits just downstream. This is the site of the Shoals Ferry, one of the many ferries that crossed the Yadkin until the 1930s. Two additional ferries operated in this area: up river was Hall’s Ferry at Siloam, and down river was Hauser’s Ferry at Donnaha. Hall’s ferry was the last commercial ferry on the Yadkin, replaced in 1938 by a WPA-built bridge. The ferries were wooden, flat-bottom boats, usually guided across the river by a cable. They were large enough to “take in a carriage and four horses at once," and were often undependable, and affected by heavy rains and storms. The average cost for a ferry crossing during the late nineteenth century was 15-75 cents, depending on the weight of the load. That equates to about 5-15 dollars in today’s money. Shoals Ferry ran from about around 1840 to about 1920. Shoals Road continues today across at the north river bank. My research indicates this was originally the site of a ford (a shallow place in a river or stream allowing one to walk or drive across), named for the Bean family, who were early settlers in that area. Bean Shoals Ford was later shortened to Shoals Ford. I can find no remnants of Shoals Ferry, either at the north or south banks. I assume all evidence—piers, posts, or other wooden structures—have been washed away by many years of spring floods. About a half-mile down from the put-in point is the beginning of Bean Shoals. It is also the site of the entrance to the failed canal project. Started in 1820, the canal was an attempt to make the river navigable from Wilkesboro to Salisbury. It was unsuccessful. As you paddle downstream you will approach the first set of islands. On the north bank (left) there is a very small, long, narrow island. To the south are a series of small islands. Take a moment to navigate to the small north island and get out. 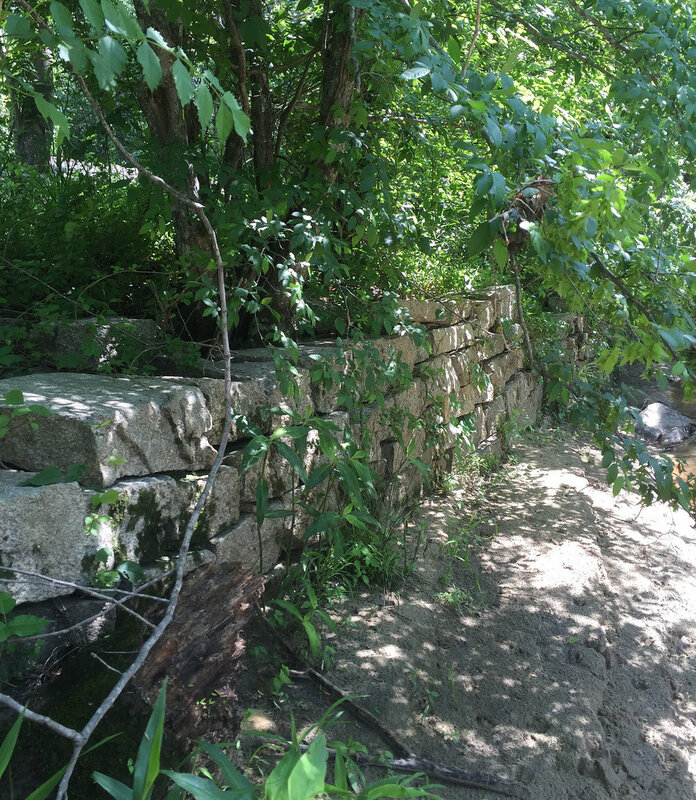 Here you will see the nearly 200-year-old stone block canal entrance. I will examine the failed canal project at Bean Shoals in my next blog post. More later.